This article is about the follower of Jesus. For other uses, see Salome (disambiguation). Not to be confused with Salomé the daughter of Herodias, who demanded the head of John the Baptist. Eastern Orthodox icon of the two Marys and Salome at the Tomb of Jesus (Kizhi, 18th century). Salome (Hebrew: שלומית, Shelomit), was a follower of Jesus who appears briefly in the canonical gospels and in more detail in apocryphal writings. She is sometimes identified as the wife of Zebedee, the mother of James and John, two of the Apostles of Jesus, and sometimes also as the sister of Mary, mother of Jesus. In Roman Catholic tradition Salome is counted as one of the Three Marys. "Salome" may be the Hellenized form of a Hebrew name, such as Shulamit, Shulamith, Shlomtsion or Shlomzion. Her name in Hebrew is שלומית (Shlomiẗ, pronounced [ʃlomiθ]) and is derived from the root word שָׁלוֹם (shalom), meaning "peace". In Mark 15:40, Salome is named as one of the women present at the crucifixion: "There were also women looking on afar off: among whom was Mary Magdalene, and Mary the mother of James the less and of Joses, and Salome". (15:40, King James Version) The parallel passage of Matthew 27:56 reads thus: "Among which was Mary Magdalene, and Mary the mother of James and Joses, and the mother of Zebedee's children." The Catholic Encyclopedia (1913) concludes that the Salome of Mark 15:40 is probably identical with the mother of the sons of Zebedee in Matthew; the latter is also mentioned in Matthew 20:20, in which she petitions Jesus to let her sons sit with him in Paradise. In John, three or perhaps four women are mentioned at the crucifixion; this time they are named as Jesus' "mother, and his mother's sister, Mary the wife of Cleophas, and Mary Magdalene." (John 19:25 KJV) A common interpretation identifies Salome as the sister of Jesus' mother, thus making her Jesus' aunt. Traditional interpretations associate Mary wife of Clophas (the third woman in the Gospel of John) with Mary the mother of James son of Alphaeus (the third woman in the Gospel of Matthew). In the Gospel of Mark, Salome is among the women who went to Jesus' tomb to anoint his body with spices. "And when the sabbath was past, Mary Magdalene, and Mary the mother of James, and Salome, had bought sweet spices, that they might come and anoint him." (Mark 16:1 KJV) They discovered that the stone had been rolled away, and a young man in white then told them that Jesus is risen, and told them to tell Jesus' disciples that he would meet them in Galilee. In Matthew 28:1, two women are mentioned in the parallel passage: Mary Magdalene and the "other Mary" – identified previously in Matthew 27:56 as Mary the mother of James and Joses. The canonical gospels never go so far as to label Salome a "disciple" ("pupil" mathētēs), and so mainstream Christian writers usually describe her as a "follower" of Jesus per references to the women who "followed" and "ministered" to Jesus (Mark 15:41). The controversial Secret Gospel of Mark, that was referred to and quoted in the Mar Saba letter ascribed by his modern editors to Clement of Alexandria, contains a further mention of Salome which is not present in the canonical Mark at 10:46. Clement quotes the passage in his letter: "Then he came into Jericho. And the sister of the young man whom Jesus loved was there with his mother and Salome, but Jesus would not receive them." The lines complete a well-known lacuna in Mark as the text currently stands. In the early but non-canonical Greek Gospel of the Egyptians (early 2nd century), Salome appears again as a disciple of Jesus. She asks him how long death would hold sway, and he says to her, "So long as women bring forth, for I come to end the works of the female." To this Salome replies, "Then I have done well in not bringing forth." It would appear from this text that there was an early tradition that Salome the disciple was childless, and possibly unmarried. In the Gospel of Thomas there is a reference to Jesus reclining on a couch and eating at a table that belonged to Salome and being asked by her: "Who are you sir, that you have taken your place on my couch and eaten from my table?" Jesus answers: "I am he who is from the One, and the things that belong to the Father have been given to me." Salome replies, "But I am your disciple", and Jesus answers, "When the disciple is united he will be filled with light, but if he is divided he will be filled with darkness." A 2nd-century Greek, Celsus, wrote a True Discourse attacking the Christian sects as a threat to the Roman state. He described the variety of Christian sects at the time he was writing, c. AD 178, as extremely broad. His treatise is lost, but quotes survive in the attack written somewhat later by Origen, Contra Celsum ("Against Celsus"): "While some of the Christians proclaim [that] they have the same god as do the Jews, others insist that there is another god higher than the creator-god and opposed to him. 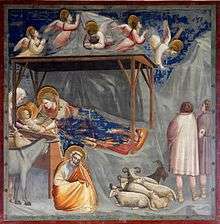 And some Christians teach that the Son came from this higher god. Still others admit of a third god - those, that is to say, who call themselves gnostics - and still others, though calling themselves Christians, want to live according to the laws of the Jews. I could also mention those who call themselves Simonians after Simon, and those naming themselves Helenians after Helen, his consort. There are Christian sects named after Marcellina, Harpocratian Christians who trace themselves to Salome, and some who follow Mariamne and others who follow Martha, and still others who call themselves Marcionites after their leader, Marcion." Salome (right) and the midwife (left), bathing the infant Jesus, is a common figure in Orthodox icons of the Nativity (fresco, 12th century, "Dark Church", Open Air Museum, Goreme, Cappadocia. "14 And the midwife went out from the cave, and Salome met her. 15 And the midwife said to her, "Salome, Salome, I will tell you a most surprising thing, which I saw. 16 A virgin has brought forth, which is a thing contrary to nature." 17 To which Salome replied, "As the Lord my God lives, unless I receive particular proof of this matter, I will not believe that a virgin has brought forth." 18 Then Salome went in, and the midwife said, "Mary, show yourself, for a great controversy has arisen about you." 19 And Salome tested her with her finger. 20 But her hand was withered, and she groaned bitterly, 21 and said, "Woe to me, because of my iniquity! For I have tempted the living God, and my hand is ready to drop off." That Salome is the first, after the midwife, to bear witness to the Miraculous Birth and to recognize Jesus as the Christ, are circumstances that tend to connect her with Salome the disciple. By the High Middle Ages this Salome was often identified with Mary Salome in the West, and therefore regarded as the believing midwife. 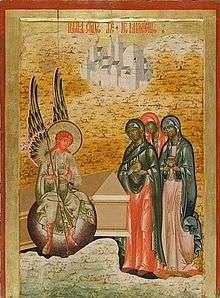 An apocryphal Coptic Book of the Resurrection of Christ, attributed to the apostle Bartholomew, names the women who went to the tomb. Among them were: Mary Magdalene; Mary the mother of James, whom Jesus delivered out of the hand of Satan; Mary who ministered to him; Martha her sister; Joanna (perhaps also Susanna) who renounced the marriage bed; and "Salome who tempted him". 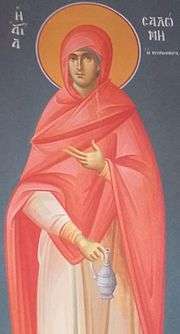 Hagiography, fresco, of Saint Salome in Greek Orthodox Church. She is commemorated in the Eastern Orthodox Church on the Sunday of the Myrrhbearers, i.e., the third Sunday of Pascha (Easter). Her feast day in the Latin Rite of the Roman Catholic Church is October 22 and in the Calendar of Saints of the Lutheran Church - Missouri Synod on August 3 with Joanna and Mary. In art, she is often portrayed with the Holy Family in paintings of the Holy Kinship. She is also portrayed holding a thurible as a symbol of her sacrifice and faith in Jesus Christ. Wikimedia Commons has media related to Salome (disciple). Wikisource has the text of the 1897 Easton's Bible Dictionary article Salome. ↑ Herbermann, Charles, ed. (1913). "Salome". Catholic Encyclopedia. New York: Robert Appleton Company. ↑ In 1980 the Mar Saba letter was included in the revision of the standard edition of works of Clement of Alexandria: Otto Stählin and Ursula Treu, Clemens Alexandrinus, vol. 4.1: Register, 2nd ed. (Berlin:Akademie-Verlag, 1980), XVII–XVIII.